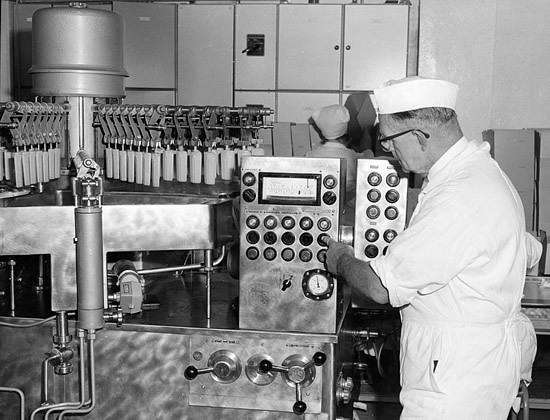 The introduction of continuous production machinery and concurrent advances in refrigeration and refrigerated transport during the 1950s and 60s enabled ice cream to be manufactured more economically, and on a larger scale. The new technology also meant ice cream could be distributed greater distances, and at lower cost, to the point that nation-wide distribution was possible. Tip Top Ice Cream staff loading freshly-filled cans into a blast freezer, 1950's. - Sparrow Industrial Pictures Ltd, Auckland War Memorial Museum online collection. 1951 - Tip Top (Auckland) took over Peters Ice Cream (NZ) Ltd, one of its larger competitors. In 1953 the NZ Ice Cream Manufacturers' Association could claim 49 ice cream manufacturing companies as members. However many of those were small businesses, located in towns and cities across the country. They supplied their local areas and produced their product by batch methods. Product ranges were narrow, and marketing budgets small. As the larger manufacturers became more efficient, and more powerful, many small producers either went out of business, merged, or were taken over by the larger companies. Many of these manufacturers were absorbed into one or other of the two Tip Top Ice Cream companies (later General Foods Corporation), which gradually expanded their operations during the 50s and 60s to become by far the country's largest ice cream manufacturer. 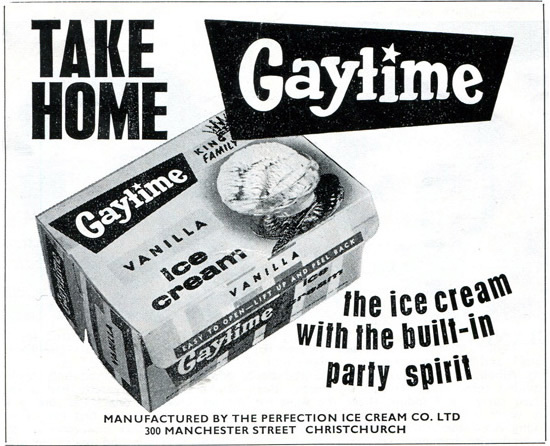 It wasn't just the provinces that Tip Top had in its sights - in 1952 Tip Top Ice Cream Company (Auckland) Ltd, under Bert Hayman, launched a new ice cream business in Melbourne, Australia, Toppa Ice Cream Ltd. The Toppa brand was very successful, and the company grew to be a major player in the Victorian and Tasmanian markets, operating until 1972. Read more about the Toppa story here. Tip Top Ice Cream steel advertising sign, early 1950s? Featuring "Daisy" the cone. With its greater economies of scale, Tip Top was able to invest in the technology to produce more sophisticated water ice and ice cream stick novelties. 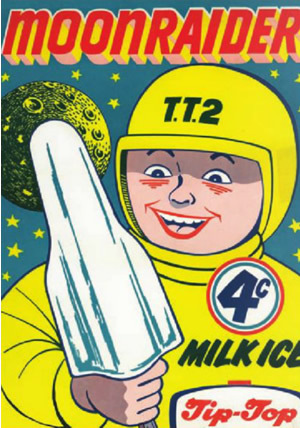 Some of the earliest were the Topsy (chocolate-coated vanilla ice cream on a stick), and the TT2 (flavoured water ice on a stick). 1951 - the classic Kiwi stick ice cream, the Jelly Tip is born. Creamy Tip Top vanilla ice cream on a stick, tipped with a raspberry flavoured jelly, and coated with chocolate, selling for sixpence. 1954 - Tip Top launches the Strawberry Toppa - vanilla ice cream on a stick, coated with a shell of strawberry water ice. One of the bitterest and longest-running arguments with government, which directly affected matters of supply and profitability, was the relationship between ice cream manufacturers and the dairy industry. In the '20s and '30s, the ice cream industry had unsuccessfully argued to be treated by government as part of the dairy industry, and for ice cream factories to be registered as dairy factories. By the 1950s, however, this had all changed, in part due to the formation of the Milk Marketing Board, and government efforts to nationalise the town milk industry. 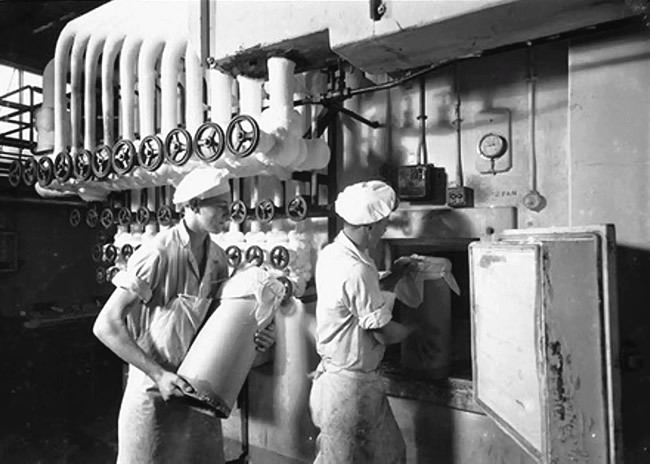 In 1944 the Milk Act was passed which provided for the ice cream industry to buy surplus butterfat from the milk treatment stations at annually negotiated prices. A levy was put in place, and tight price controls. 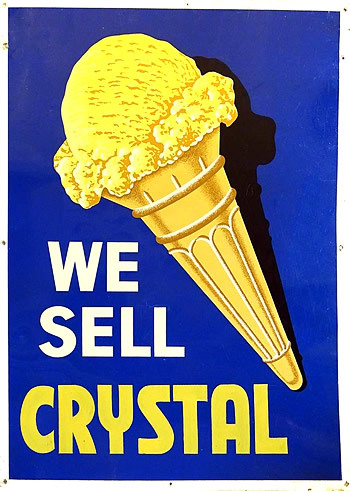 When rationing and consumer price control restrictions were lifted after the war, the ice cream manufacturers found themselves the only ones that had to pay the export realisation price for butterfat while other food manufacturers paid the ordinary (effectively subsidised) wholesale price. 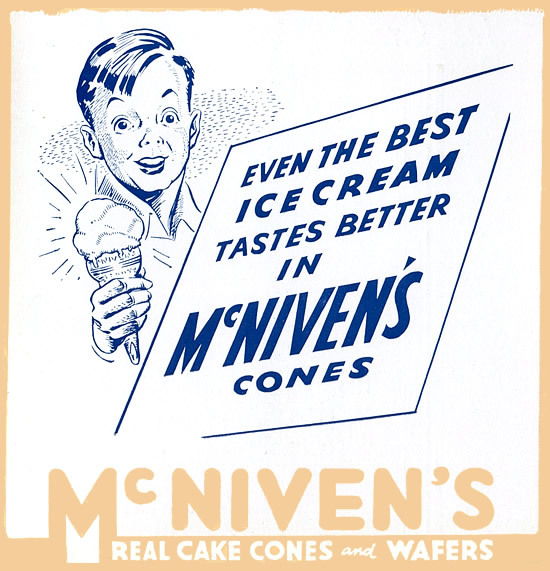 McNivens ice cream cone and wafer advertisement, 1946. - The Frostee Digest, NZICMA archives. 1953 - Ice cream manufacturers were furious at the ongoing impasse with the government over regulatory control of town milk pricing - this meant that ice cream companies were charged 8d more per pound of butterfat than cheese or butter producers. The Minister replied that while ice cream is a food stuff, it cannot be regarded as basic or essential, therefore did not qualify for the 'subsidy' - although biscuits, confectionary and pastry goods all apparently did. This debate raged on for another decade, and it was 1987 before the industry was no longer required to pay export realisation prices for butterfat. 1953 - There are reports in the press that Cheltenham Co-Op Dairy Company of Fielding is planning to purchase an ice cream operation - the first time a manufacturing dairy co-operative had ventured into the ice cream business. The move (which does not appear to have come to anything) created great concern amongst established ice cream producers because of the dairy industry's inherent advantages of raw material cost, supply and scale, and its tax-free status. 1954 - During this year ice cream production reached 4 million gallons, or 15.36 pints per head of population, a 10% increase on the previous year. 2.36 million gallons (58%) was sold as "bulk" ice cream, ie., in large containers for scooping. 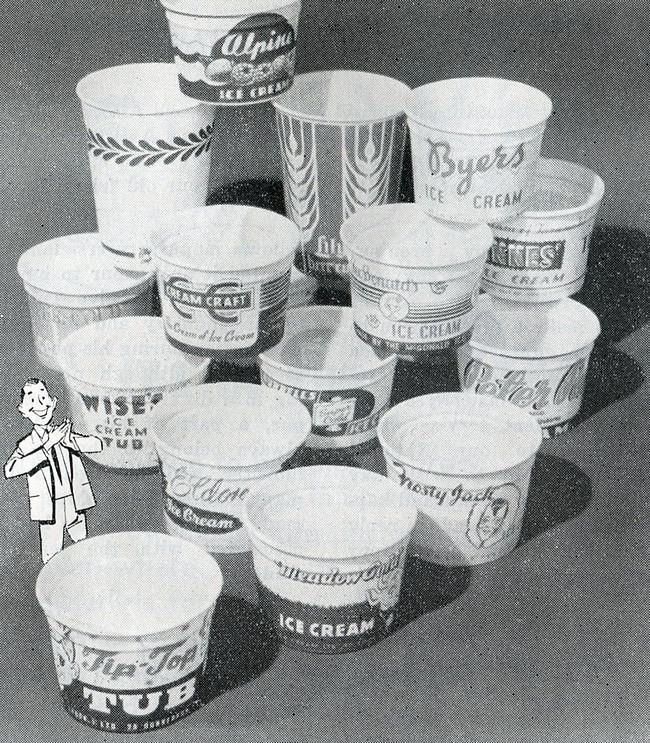 Bulk ice cream was filled into 1 gallon or 2 1/2 gallon cans, or larger, for distribution to dairies and milk bars, either scooped into cones (a pint produced seven to eight four-penny ice cream cones), or served in cups or on dishes. NZICMA bulk (scoop) ice cream poster and guide to usage, early 1950s. However there was now one domestic refrigerator in every two homes in New Zealandand the spread of refrigerators brought about a big change in the proportion of ice cream sold as traditional "bulk" ice cream, to more and more "take-home" ice cream. 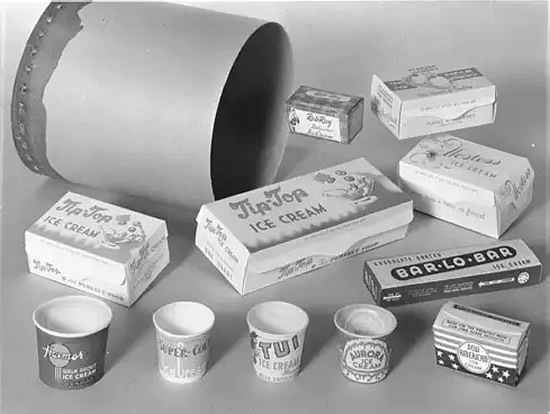 Take-home ice cream was packaged at the factory, most commonly in waxed cardboard pint and quart packs, but also in half-pints, and "sixpenny bricks", for home consumption. Wholesale and retail pricing for bulk, take-home and novelties, by region, 1954. NZICMA take-home display card in window. Another successful radio advertising campaign which ran from 1957 to 1960 was based on the slogan "Meal Time is Ice Cream Time". 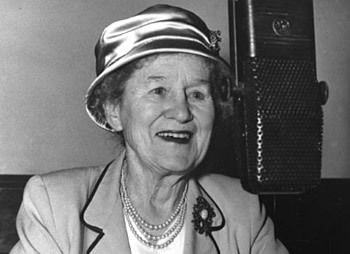 Leaflets were distributed widely to back up the radio adverts, which were fronted by Aunt Daisy (above). The campaign promoted ice cream at breakfast, lunch and dinner time. 1954 - The Food Hygiene Regulations were amended to allow 'composite shops', ie., those selling vegetables and other un-packaged foods, to also sell bulk ice cream, scooped on the premises. - Te Ara – The Encyclopedia of New Zealand. 1955 - another, potentially not-so-healthy ice cream marketing exercise was run by Westland Snowflake Ice Cream Ltd, when it advertised Uranium Ice Cream. Listen to Owen Norton, former owner and Director of Westland Snowflake, explain the background, talking to Bryan Crump on Radio NZ National programme - Kete West Coast. 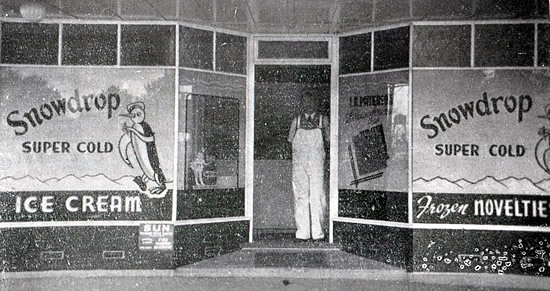 Burrell's Ice Cream advertised on Frost Bros.dairy and grocery, on the corner of Rangitikei and Featherston Streets., Palmerston North, 1955 (detail). Photo by Bruce Watt. 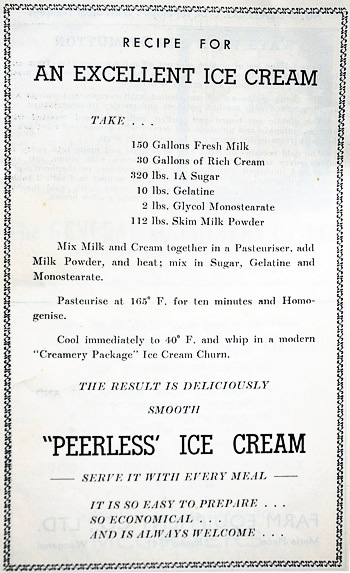 Peerless Ice Cream advertisement, 1950s. Wanganui Free Kindergarten Assn. Recipe Book, via Massey family. Gelatine (made from beef skin) was one of the most common commercial stabilisers used, with benefits of slowing ice crystal growth during storage, and giving the ice cream a very smooth texture, and clean flavour release. Glycerol Monostearate (GMS), a derivative of tallow, was the typical commercial emulsifier used, helping the integration of milkfat and protein during processing, and also contributing to a smoother, better-keeping product. Ice cream packaging, late 1950s, Sparrow Industrial Pictures Ltd. Bulk can (scooping pack), top left. New American, Aurora, Tui, Super Cold, Havmor, Tip Top. From an advertisement for "The new Lily Ice Cream Tub", 1958. Manufactured in N.Z. by Carton Specialties, distributed by Frank M. Winstone Ltd. Branded tubs include Alpine, Byers, Innes', McDonald's, CreamCraft, Super Cold, Wise's, Burrells, Peter Pan, Eldora, Frosty Jack, Meadow Gold and Tip Top. 1954 - Coker & Mills Ice Cream was established in a factory that was originally a malthouse for a brewery, in Dodson St, Blenheim. By 1955, the ice cream unit used for the NZ consumers price index (CPI) basket of goods and services was changed to a pint block (568mls), which was valued at 20 pence ($3.65 in today's terms). Crystal Ice Cream (Dunedin) sign. 1959 - Regulations were introduced for the Control of Over-Run in Ice Cream, over-run (increase in volume due to the addition of air during the whipping process) to not exceed 100%, measured by weight of solids per gallon. August 1961 - A new ice cream standard was set - a return to a minimum butterfat content of 10%, and the use of any fat other than milk fat was prohibited. 1960 - The Wellington and Auckland Tip Top ice cream businesses merged to form a new company, General Foods Corporation (New Zealand), with Len Malaghan as Managing Director. Tip Top Half-Gallon can lid, 1960s. 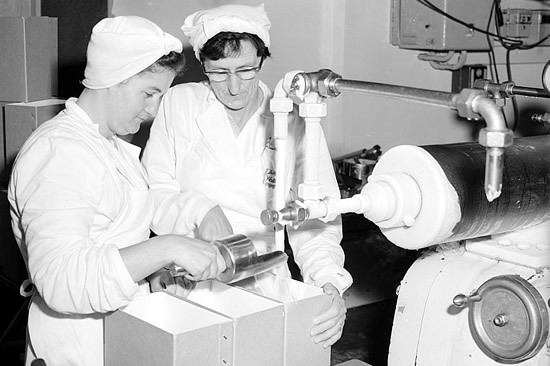 In 1962, Tip Top Ice Cream Company built what was at the time the Southern Hemisphere's largest and most advanced ice cream factory, costing NZ$700,000. 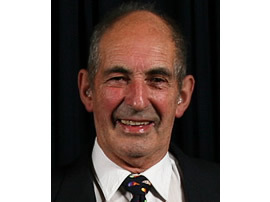 Prime Minister Keith Holyoake attended the opening ceremony. The Tip Top factory included staff houses and 20 acres of farm land overlooking Auckland’s Southern motorway. Over time, the Tip Top factory became a New Zealand landmark, known to generations as ‘Tip Top Corner’. 1963 - The Simon family opened the Manda ice cream business, with a factory in Leet St., Invercargill. 1964 - Tip Top launched the Tip Top Trumpet, its version of the European cornetto-style, waffle-coned ice cream sundae with nuts and chocolate. The original Trumpet sold for 1 shilling (1/-), and came with an extensive advertising campaign, including one of our very early TV advertisements. More about the very first Tip Top Trumpet. 1966 - Multinational Unilever, already well established in New Zealand with its Birds Eye Frozen Foods operation, purchased two ice cream factories from Fropax (N.Z.) Ltd (Vestey Group, vegetable and meat processors, Blue Star Line shipping) - the Frosty Jack factory in Palmerston North, and the Meadow Gold factory in Papatoetoe, Auckland. The Wall's ice cream brand was launched, with national distribution of take-home ice cream, and a full range of stick and cone novelties (Woppa, Splice, Lickity Stix, Nutty Choca, Torpedo, Tornado). 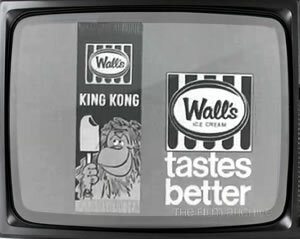 Wall's bulk ice cream filling, Palmerston North, January 1968. 1968 - Tip Top opened its new South Island ice cream factory in Christchurch, on Blenheim Road. The marketing of novelties, along with take-home ice cream, required more imaginative presentation, shapes, flavours, packaging, labelling, and of course, names. 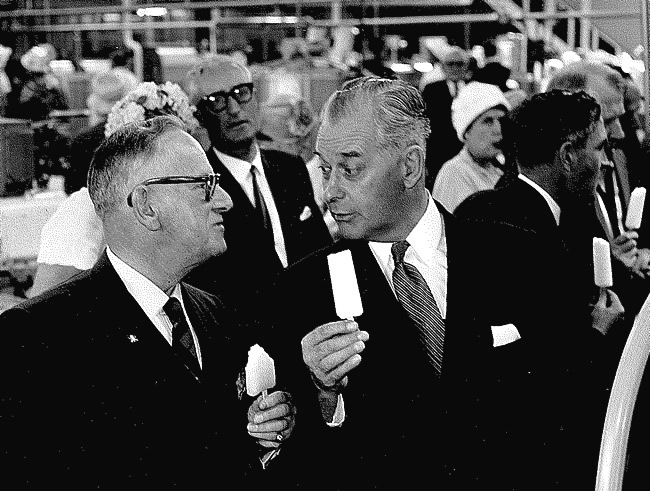 1957 - The annual conference of the NZICMA notes "phenomenal growth in the ice lolly trade". In the 60s, a profusion of stick novelties appeared, with product innovation and marketing efforts spurred on by the licensing of characters and imagery from popular cartoons, movies and television programmes. - Owen Norton collection, via Shona McCahon. 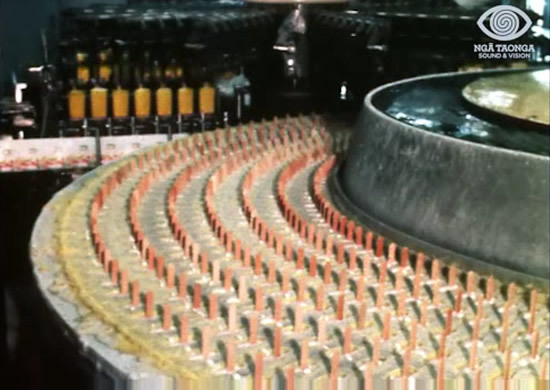 Seven-lane Gram stick novelty machine, Tip Top Mt Wellington factory, 1964. Still from the documentary film, "All About Ice Cream", Robert Steele Productions. Gram stick novelty machine, Wall's, Palmerston North, January 1968. A large number of small, regional ice cream manufacturers were victims of takeovers and growing competition from larger companies in the '50s and '60s. Apex (Christchurch), Aurora (New Plymouth), Barlow's (Te Aroha), Bell's, Betta, Blue Moon (Hastings), Byers (Palmerston North), Clarke's (Petone), Coker & Mills (Blenheim), Cooke's (Auckland), Crystal (Dunedin), Eldora (Auckland), Frosty Jack (Wellington), Gates' (Wellington), Gaytime (Auckland), Glacier, Hart's (Auckland), Mays (Auckland), McDonald's (Hamilton, Palmerston North, Auckland), Meadow Gold (Auckland), Newells, Newjoy (Dunedin), Perfection (Christchurch), Peters (Auckland), Reale (Dunedin), Righton's (Whakatane), Robinson's (Auckland), Rosco (Hamilton), Royal (Dunedin), Snowdrop (Ashburton), Snowflake (Auckland), and Sunshine (Nelson). 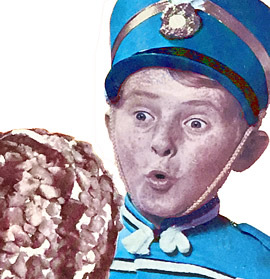 Who invented Hokey Pokey ice cream? There are several stories, and a lot of speculation. One story says that Hokey Pokey was first sold as a commercial ice cream flavour by the Meadow Gold Ice Cream Company of Papatoetoe in the 1940s. Except that we don't believe the company existed until the mid-'50s! 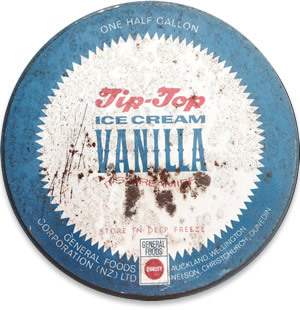 Another says that Tip Top Ice Cream Co. (Auckland) was the first to make it, around the same time, although again, the story is not well documented, and anyway, sugar rationing raises serious doubts that a product like this could have been launched during the war years. A third story has Peter Pan Ice Cream in Waipukurau making the first Hokey Pokey ice cream in the mid '50s. Another strong claim for "invention" of the flavour is made by ice cream industry legend, Brian Simon. 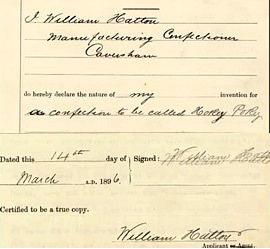 A handwritten application for the patent of a recipe, the invention for a confection to be known as Hokey Pokey, was lodged by William Hatton, a manufacturing confectioner from Caversham, Dunedin, at the New Zealand Patent Office on 14 March 1896. Since 1868, Dunedin had been home to the very successful Hudson biscuit and confectionery company. Is it possible that Hatton's business, or his skills, or just his recipe, were acquired by Hudson so that they could manufacture Hokey Pokey? By 1930, Hudson became Cadbury Fry Hudson, the company that was making Crunchie Bars in 1953, when Newjoy started to put them into ice cream. So there is a remote, romantic possibility that William Hatton, very indirectly, had a hand in the first Hokey Pokey ice cream! Whoever invented it, the love affair has gone on for at least 50 years now. Where else in the world would they give an ice cream flavour its own postage stamp? As much a part of our summer as pohutukawa, jandals, and L&P, Hokey Pokey ice cream has become a Kiwi cultural icon. Crunchy, gooey honey-comb toffee pieces in vanilla ice cream, a taste experience all of its own. 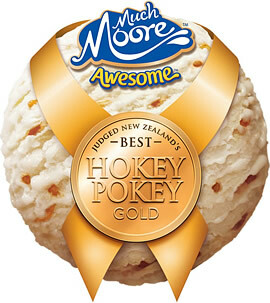 Much Moore Hokey Pokey Ice Cream, winner of the special "Best of Hokey Pokey" category at the 2012 NZ Ice Cream Awards. 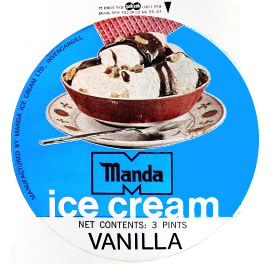 Manda Vanilla ice cream 3 pint label. 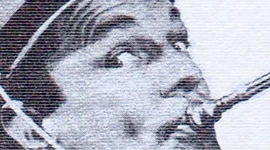 21 years before that famous "VW Beetle" ad, the first-ever Tip Top Trumpet TV advert starred another soon-to-be-famous Kiwi.